A fundraising letter asking for support for the Dyke TV Beijing Project to attend the NGO Forum at the United Nations World Conference on Women to record testimonies from women. 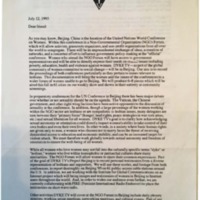 The letter notes a partnership between Dyke TV and FIRE (Feminist International Radio Endeavor) to also bring recorded testimonies to short wave radio. Dyke TV, “Dyke TV Beijing Project,” Herstories: Audio/Visual Collections of the LHA, accessed April 26, 2019, http://herstories.prattinfoschool.nyc/omeka/document/DykeTVBeijing.